How can IT leverage an enterprise CPQ (configure-price-quote) solution? Many years ago, enterprises began including a special department within their organisational structures for the express purpose of handling recorded data and information. The structure, definition and focus of these organisational units have evolved and changed to reflect changing management styles, technological developments and the essential needs of the enterprise. This evolution can be traced roughly in parallel with names we assigned to these organisational units. The Tabulation Department, Data Processing, Management Systems and Management Information Systems are several of the common handles we assigned to these groups at various times over the years. Today, we typically use the simple abbreviation, IT or the full name, Information Technology, to describe the group that oversees our collective enterprise memory in the form of systems technology, applications, data and information. Get the right information to the right people, in the appropriate form, in the shortest amount of time possible and at the lowest possible cost. Throughout most of this history, the information management functions have been seen as cost centres. They have frequently operated under the objective of accomplishing their mission through tough budget restraints and cost controls. The never-ending mantra driving their strategy was get the job done, but do it cheaply. Today, more is expected of IT. IT now has to contribute to the business in a revenue-positive manner, which creates a great opportunity to actively participate in the production of revenue for the enterprise in several ways. Revenue production is typically centred on selling products and services. Each link in the process chain that supports the sale of products and services is automated to a degree with some specialised application. Marketing Automation, Customer Relationship Management, Sales Automation, Order Management and other systems combine to facilitate the specific operations associated with each phase of the revenue-generation process. IT has the responsibility and opportunity to ensure that these individual systems are integrated properly with each other to collect, process and distribute the data required to facilitate the efficient production of revenue. At the heart of this application stack or more properly application chain, is CPQ or configure-price-quote technology. CPQ is the essential element that ensures product, configuration, price and customer satisfaction combine within the context of a buying transaction. 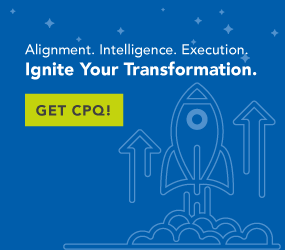 CPQ relies on data. Marketing and product management supply product data and information in the form of specifications, usage applications, regulatory elements, environmental limits and other factors. These determine how the product can best be applied to solve customer issues and pains. Marketing and Finance supply pricing data and special contractual information that drives what pricing should apply to a given customer. The manufacturing requirements for data supplied by CPQ are provided in the form of part listings and bills of material for inventory and supply acquisition as well as production scheduling. IT is the only element within the enterprise that is in a position to adopt a holistic view of this revenue production system. Each element within the process will undoubtedly have needs, requirements and specific preferences as far as application or solutions that are best suited for their own needs. IT must balance these needs with systems and functional processes as a whole. IT delivers and supports a fully functional revenue production system by ensuring that each application link integrates with, communicates with and supports the other applications within the system as a whole. For CPQ, this means making sure CRM supplies accurate and complete customer data, product management supplies product data and usage parameters and Finance provides accurate pricing and contract data to the CPQ system. This integration, support and maintenance process is what IT delivers for each element in this system. This is how IT enables and ensures the efficient generation of revenue.